As the 2018 season has opened up almost everywhere across the country, many of us get out there for our first visits of the year. Mine was to Six Flags St. Louis. I spent a few hours here enjoying one of the few nice days we had in St. Louis during the month of April. As I arrived to the park, in the evening, many of the day’s guests were on their way out and the parking lot was emptying out so I knew I was going to have a great time. 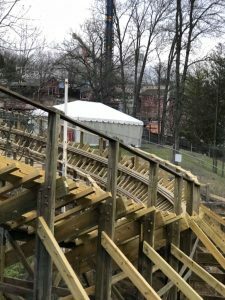 My excitement was high and my anticipation was growing by the second as I couldn’t wait to feel that exciting thrill of stepping into the first coaster of the year and going up the lift hill and down the first drop. I headed to my favorite ride at this park, American Thunder, a GCI clone, located in the front of the park. 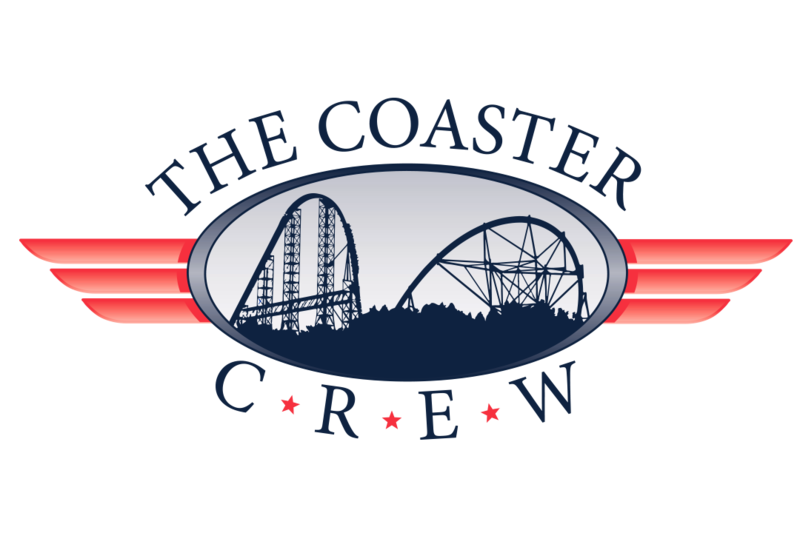 It’s a fun coaster to get started with for the day or to end your day with. After that ride, I made my way around the park experiencing many of their other coasters, though I did skip a few. 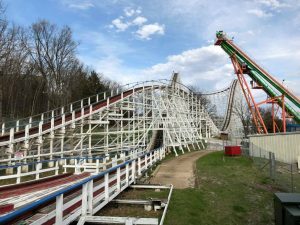 But this entry isn’t about what I did and where I went in the park but rather about what are some of the new changes to SFSTL and what are some of the must do’s for this park. So let’s get to that. Now you may also wonder why I choose to write about this park first instead of some of the other great parks so close to St. Louis. Well, that’s simple, I wanted to shine some light on a park that doesn’t get very much attention with some of the amazing parks that are within 5 hours of here. 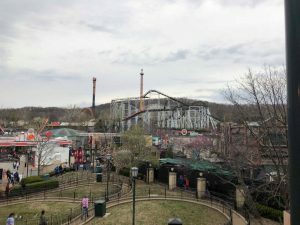 There are a few changes and additions that were made this off season that also makes this a park to talk about early in the year. The major addition is going to be coming to their water park, which opens Memorial Day Weekend, in the form of a new slide called Typhoon Twister. Based on the location of the water park the progress is hard to fully track, however I was surprised to see that about a month before it’s suppose to open the the entire slide was sitting in the far end of the parking lot and it appeared that only footers were completed for it. Overall it’s a needed addition to the water park and hopefully next year we will see a major addition to the dry park, as they are due for a coaster. The large change that took place was with The Boss. They re-profiled the ending of the ride from a double helix to a single dive down turn to a double up. This new section of track is an amazing improvement over the double helix and makes this a lot more rideable then it has been in the past, and the double up at the end is very fun. I’m not the world’s biggest supporter of this coaster but this improvement moved it up my list enough to ride it again next time I go, which was not the case in previous years. Continued re-tracking of The Boss could easily make this the best coaster in this park, but it’s still a ways off for me. However, it’s worth your time to ride this massive CCI. 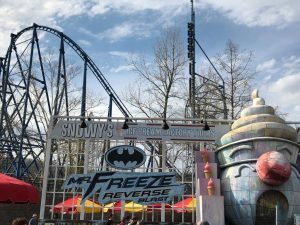 One last change, though temporary, is to Batman: The Ride, which will be offering riders the option to ride the coaster backwards for a limited time. They did this last year but I didn’t get a chance to make it to the park during the time they were running it backwards, but this year I was excited to get to try this out. Standing in line I found myself getting more and more excited as I approached the station. Almost like it was a coaster I’d never been on. That anticipation was building and that feeling of excitement in my stomach was growing; I couldn’t wait. While going up the lift hill and feeling the pre-drop I knew I was in for one intense ride. 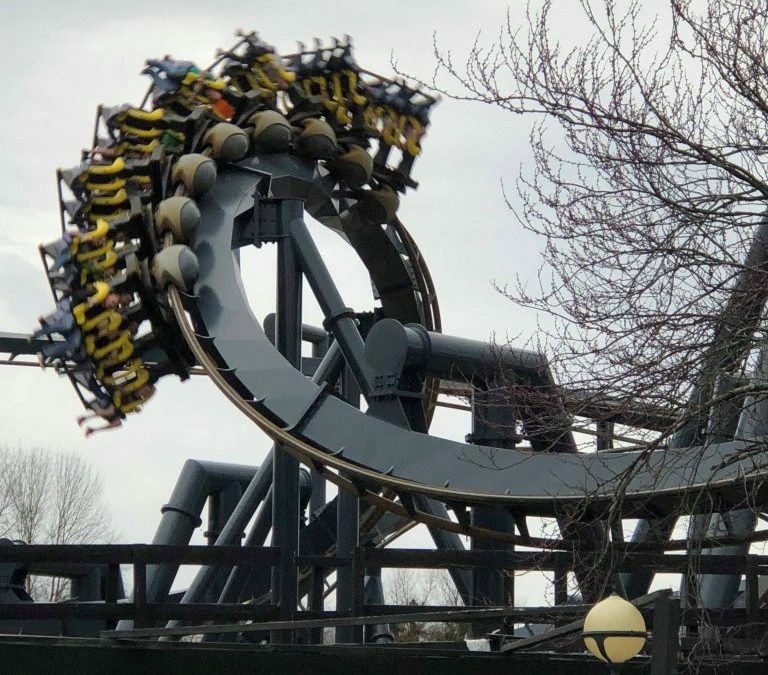 We all know the Batman clones are prone to being pretty intense compact coasters, and going backwards definitely increased this feeling. I felt the pulling, pushing, twisting, and turning more then I ever have riding this coaster before. It was a very cool and very unique experience that I’m glad I got to try out this year while it was here. Now that we’ve covered what the new addition and the major change is here, lets talk about what else there is to do. 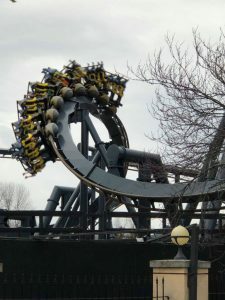 They have lots of coasters here that you can find at other parks but none that are closer then 4-5 hours; with a Boomerang located at Worlds of Fun and a Batman: The Ride located in Six Flags Great America. 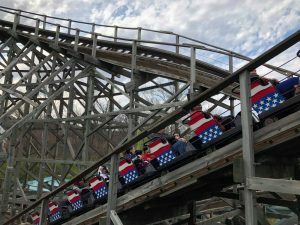 They have a good collection of wooden coasters so if that’s your thing you have 3 very different types of woodies to enjoy with American Thunder, The Boss, and The Screamin’ Eagle. They also feature some very fun steel coasters with the Mr. Freeze Reverse Blast and Batman: The Ride. If family coasters are your thing then they’ve got you covered there as well with Pandemonium and The River King Mine Train. They also offer a decent flat ride collection with some of the standouts being a Larson Loop Fireball (Yes, its a flat ride not a coaster), Justice League Dark Ride, Spinsanity a Zamperla Disco, Tsunmai Soaker a Mack Twist, a Starflyer, and Splash, an Imitamin drop tower featuring Superman, and the very unique Xcalibur. Overall, this is a fun park with the amazing back drop of the foothills of Eureka and lots to do for the thrill seeker or the family together. Its wide range of coasters, flat rides, and family rides gives you plenty to do. You should be able to cover this park in 1 day. Families may need more time if coming with smaller children, while just coaster seekers could do it in half a day.